You'll like the way we grow roses. 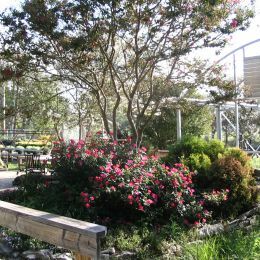 We grow hybrid tea roses, climbers, floribunda, grandiflora, and shrub roses. 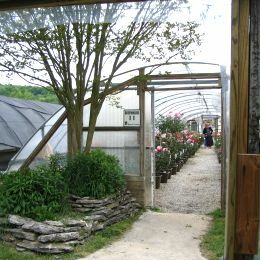 We order our roses at least one year in advance, from the best rose growers in the country (O.L. 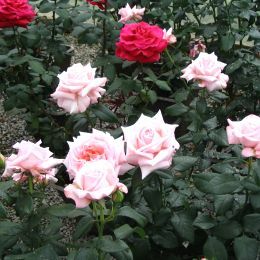 Weeks, Star Roses and Certified Roses), so that we can get the very best quality plants available. We have them shipped to us in the winter in refrigerated trucks, so that they remain dormant. We then prune and plant the roses in our own soil mix, in oversize pots to allow maximum space for root growth. We place them in 2 unheated greenhouses, grow them slowly (not forced), until you buy them in the spring. 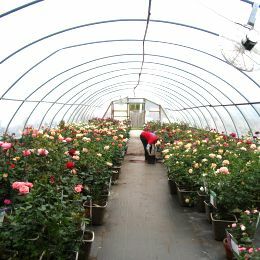 The rose crop is available anytime after planting, usually from mid-February through May, but they really sell quickly from April until Mother's Day, after which they're all gone until the following spring. 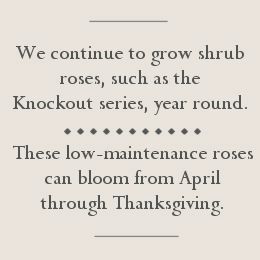 We continue to grow shrub roses, such as the Knockout series, year round. These low-maintenance roses can bloom from April through Thanksgiving. 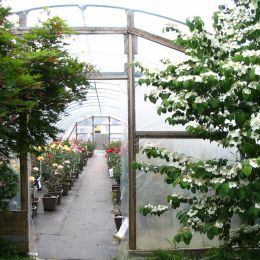 During spring, most roses are grown in Greenhouses Number 7 and 8.